The range of Dr Neubauer products became famous for their frictionless long pimple rubbers, a unique and highly innovative product used by players worldwide. 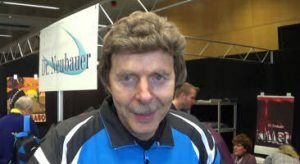 Since the frictionless long pimples ban by the ITTF, Dr Neubauer has remained a leader in alternative rubbers and blades, that allows player to continue playing a similar style. They now have a full range of table tennis product for a wide variety of players, yet continue to advance the technology in specialised blades and rubbers, that allow for an alternative or disruptive style of game. Through my dealing with Dr Neubauer via OOAK Table Tennis Shop, a distributor for their products, I got to know Dr Neubauer and his son Carsten quite well, and they kindly agreed to an interview. Questions are posed by myself and other members of OOAK Table Tennis Forum. Many thanks to OOAK Forum members for posting these questions! I’d like to publicly thank Dr Herbert Neubauer for all the time and effort he spent, giving us these detailed answers! Alex: What style did you play as a junior and when did he start with Long Pips? 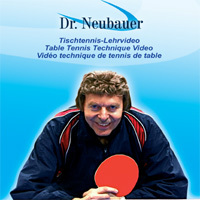 Dr Neubauer: I started playing table tennis at the age of 13 with a “Barna” hardbat. Then I switched to inverted rubbers at the age of 19, developing a quite powerful attacking game through counter-attacking, hitting and looping (topspin).My special stroke was the backhand hit. I started using long pips at the age of 45 only. Alex: Did he have any mentors in the learning and development of Long Pips techniques? 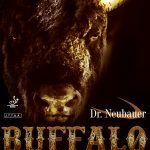 Dr Neubauer: No. My footwork got less effective so I was trying to find a way to slow down the speed of the game. For some time I was even using frictionless long pimples on both sides (forehand and backhand) but finally I realised that I need to be more versatile since this type of game turned out to be too predictable for my opponents. I was watching other players using their long pimples and started developing my own series of techniques, both for blocking and attacking. Alex: Some members are curious in what area you’re a Doctor? 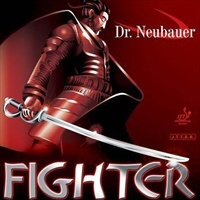 Dr Neubauer: I’m a doctor in Economics. Alex: Is it true that you played in the Bundesliga with two inverted rubber in the 70’s. Dr Neubauer: Yes, I played several years in the first Bundesliga with the club Hertha BSC Berlin, while studying at university at the same time. As mentioned above I used inverted rubbers on both sides. Alex: I have your excellent LP training DVD and am an avid fan of your offensive LP playing style! So I ask you, why do you think top professional players like JOO Se Hyuk and CHEN Weixing use their LP almost exclusively for chopping and not in a more offensive or varied manner? Dr Neubauer: It is a pity indeed that JOO and CHEN don’t use their long pimple rubbers more often and in a more effective way, for example for service returning or for attacking against chopped balls. It would appear that they have never been taught this. Also neither of them is twiddling the bat consistently to use the inverted rubber for attacking on the backhand, for example while moving towards the table to return a drop shot. Alex: Do you believe an LP or antispin close-to-the-table blocker playing an active, aggressive blocking style could ever get as high as the world’s top 10? If not, why not? If so, what qualities/techniques do you think such a player would have to possess? Do you think that rising to a high level with this style is more or less possible in the aftermath of the frictionless ban? Dr Neubauer: It is extremely difficult to get to the world’s top 10, regardless of the material used. Theoretically it should be possible to reach that level with long pimple or Anti-Spin rubbers however the player would need to be able to twiddle the bat very effectively in order to make life difficult for the opponent. The player could use this type of rubber on the backhand for blocking on topspin and for producing aggressive pushing on chopped balls, while twiddling whenever necessary to attack through fast looping (topspin) or hitting with an inverted rubber. The player would also need to have an excellent forehand attacking and a tremendous service. Most of all he needs a very good footwork, a great touch for the ball and the ability to use the long pips (or anti-Spin) rubber on the forehand in an effective manner too. It goes without saying that it is very, very difficult to combine all this! So in other words I could hardly imagine that this could happen. Alex: Are techniques for the ABS or Grizzly ABS much different from what you demonstrated on your first anti-spin video? Any new shots you can tell us about? Dr Neubauer: Principally you may use the same techniques for our recent Anti-Spin rubbers ‘A-B-S’ and ‘Anti Special’. These 2 new rubbers are very slow so they are easier to use and enable short blocking. Unfortunately there are no new techniques from my side so far. Please note that our first Anti-Spin rubber ‘Gorilla’ and ‘Grizzly’ are also available with a dampening sponge which reduces the speed and enhances control considerably. Alex: Can you lend some insight into the design process you go through when you’re developing a new pips out rubber? Dr Neubauer: As you may know we develop all our products ourselves. The development of a new product is a very time-consuming and tedious task, this holds true for any type of equipment (pips-out, Anti-Spin, blades etc. ).We cannot disclose any details about our development process however the right choice of rubber formula is even more important than the geometry of the pimples. We have a certain number of samples produced according to our specifications and test these thoroughly. Based on this test result we have new samples produced to further improve the playing characteristics. In some cases we need 1 year and a big quantity of samples in order to reach the desired final product. Alex: I have noticed that many of your company’s blades are very light (sub-70g). What is your ideal weight for your assembled racket? Dr Neubauer: I usually play with a very light blade of between 55 and 70g and thus get to a total weight of approximately 120-130g. Alex: Do you prefer OX or sponge LP for your own racket? Have you always felt that way? I am currently mostly using Anti-Spin rubbers on my backhand however I also have one bat with our new long pimple rubber ‘Fighter’ as well as a second one with our ‘Leopard’ and ‘Diamant’ in my bag, in case I was playing against somebody with a slower game where I need to put some pressure on my opponent. As to the time when I was using frictionless long pimples I have mostly used the version without sponge (OX) since this was easier to handle for short blocking. The spin reversal is nearly the same with a thin sponge (0.6mm) however the ball cannot be returned as short and low over the net while blocking with an OX rubber. Alex: Why are your company’s rubber sheets so expensive? I’ve been intrigued by several of them over the years but have always been put off by the cost. Dr Neubauer: As outlined previously, unlike most other table tennis companies we develop all our products ourselves. All rubbers and blades in our product range are the result of a tremendous research and development program that can last up to 1 year for a single product. Every development requires the production of a great quantity of samples, both for the rubbers and the blades. In the case of our Anti-Spin rubbers alone we have produced and tested several hundred pieces, not mentioning the various moulds which are quite costly. It goes without saying that we do not sell as many rubbers and blades as the big table tennis companies since our target segment (pimples-out rubbers, Anti-Spin) is much smaller. Considering the relatively high fixed costs for advertising and promotion as well as all other expenses involved in the running of a company we need to set the retail price sometimes higher than other companies. Alex: I’ve read somewhere you used different set ups for different opponents. Is there any truth to this? If so, does he recommend this for everybody or are there some pitfalls in doing this. Basically, what does he feel the advantages and disadvantages of changing equipment are to suit an opponents style. Dr Neubauer: Yes, I do have several bats in my bag, especially on the occasion of major tournaments. I currently mainly use Anti-Spin rubbers on the backhand (‘Grizzly’ with new dampening sponge and ‘Anti Special’) and short or half-long pimpled rubbers on the forehand (‘Leopard’ and ‘Diamant’). I use a slightly slower bat against strong topspin players where short blocking is most important. A faster bat helps me to produce deceptive blocking but also to perform aggressive pushing and lifting against more passive players. I also have one bat with our new long pimple rubber ‘Fighter’ which is highly effective against slow players (choppers or slow attacking players). In order to switch from one bat to another (depending on the opponent’s game) you need to have a good touch for the ball and the ability to adapt to different rubbers within a few minutes. Players who are experiencing difficulties in using other type of equipment, even after several weeks of practise, should stick to one single bat. Alex: Why do you think the antis haven’t caught on in big numbers? Are you still experimenting with antis or is all the research done? Dr Neubauer: The problem with our first generation of Anti-Spin rubbers was that they were very difficult to control. This is due to the use of a very hard sponge that enhanced the spin reversal but also made the rubber difficult to play with. The use of our then developed dampening sponge has largely facilitated the use of these rubbers. blocking on topspin with a lot of rotation. We now have several customers playing very successfully on a relatively high level with these rubbers. However the rubbers require a lot of practise in order to make the most out of it. A lot of players switched from our first Anti-Spin rubbers generation to long pimples and have not yet tested our new developments. We are currently working on several new products simultaneously (long pimples, half-long pimples, blades etc.) however it is not excluded to launch a new Anti-Spin rubber in future. Alex: What are your future plans for the next generation of Dr Neubauer products? Dr Neubauer: We are currently working on pimple-out rubbers, also we are experimenting with new blades. Our new long pimple rubber ‘Inferno Classic’ should be available for sale by February/March 2011 approximately. It will be quite disruptive while blocking and also offer good attacking possibilities. Also we should be launching a new disruptive half-long pimpled rubber which should be ready by spring 2011. Alex: Many have complained about the ITTF’s frictionless ban. Even Waldner himself said it was wrong to ‘ban a style’, which is effectively what it was. Obviously your company was affected by this ban more than anyone. Did you feel you were targeted by the ITTF? Did you feel there were other influences or external factors what motivated this ban? Dr Neubauer: Unfortunately many people at ITTF consider frictionless long pimples to be detrimental to our sport since they are believed to produce “unpredictable returns”. We have tried to explain that these rubbers merely return the spin that was imparted by the opponent in the first place, and that it is actually quite simple to turn this effect into one’s own advantage through intelligent play. We have fought against this ban however the decision was taken almost unanimously by the ITTF Board of Directors and we must accept it. Alex: Do you see a day when ITTF oppression against disruption players ends and the ban against frictionless long pips is revoked? Dr Neubauer: It is very unlikely that the ban on frictionless long pimples will lifted in the near future. Maybe there will be a possibility in a few years time, we shall have to wait and see. Alex: Apparently a lot of players at the recent world championships in Hohhot were using equipment the ITTF would classify as illegal. Was that your observation as well? Dr Neubauer: There were indeed players who have been using rubbers that are not in concordance with current ITTF regulations. However the percentage should not be too high considering the total amount of participants (2100 players in all categories). The main problem is that ITTF still has not developed a measuring device to test the friction of pimple-out rubbers. The umpires keep looking at the list of authorised racket coverings (LARC) to check whether the rubber has been homologated however they have no objective means to measure the friction. Alex: Often double inverted players throw disrespectful comments at long pimple players, such as “well done bat” or “you would not beat me with a real bat”. Do you have a good or clever response that you give to these people? Dr Neubauer: To start with it is generally not worth engaging into lengthy discussions or arguments after the match. In some cases I have given my bat to the opponent who was complaining and asked him to play a few rallies. In most cases they did not even manage to put the ball on the table, let alone keep up a rally. This experience helps them understanding that playing with long pimples or Anti-Spin rubbers is anything but easy, and that it requires a lot of practice to master it. Alex: How long it takes him in a given match to realise that his opposition has absolutely no chance of beating you since they do not understand or know hot to handle your equipment? Dr Neubauer: In some cases it takes a couple of rallies to realise that the opponent has no clue about playing against long pimples or Anti-Spin rubbers. However nowadays most players have encountered this type of equipment before and adapt their strategy accordingly throughout the match. This was one of the arguments brought forward by the fans of frictionless long pimples: This type of rubbers had been around for many years, and most players had learned how to play against it anyway. Alex: Do you ever give lessons or have seminars where you teach your techniques? If so, how do we sign up? Dr Neubauer: Unfortunately we are extremely busy with the development of our products and the general running of our company. Also we are constantly travelling to major tournaments and to visit our distributors and manufacturers around the world. This leaves no time for seminars, we are sorry for not being able to provide this service. However we have produced a total of 3 DVDs since 2003 on which are demonstrated many techniques with all kinds of rubbers. Alex: What do you think has change over the last 10 years in Table Tennis? Dr Neubauer: The game has become ever faster over the last few years with an increasing importance of footwork and aggressive shots. The current generation of Chinese players puts pressure on the opponent with the first ball (as receivers) through flicking, banana-spin and aggressive pushing, while European players tend to push this ball. In terms of long pimples the game has evolved too: It is not enough to just block the ball passively, waiting for the opponent’s mistake. The pimples must be used in a more aggressive way through active blocking (“chop-blocking”) as well as aggressive pushing, lifting and even hitting in order to put pressure on the opponent. A detailed and frank interview with Dr Neubauer, the innovative table tennis manufacturer of many new pimple, antispin and specialised blades.